I don´t think Mark needs a lengthy introduction since he´s been a long time commenter in market monetarists blogs, in addition to taking the discussion to famous Keynesian blogs such as Mark Thomas´ Economist View. Recently Tyler Cowen did a post singling out a comment he made to one of my posts. There are examples where money supply has grown despite total nominal credit market debt shrinking (one such example is the U.S. in 1946) so Koo’s claims to the contrary fly in the face of empirical reality. But what I think troubles me most about this passage is the assertion that private sector deleveraging was responsible for the decline of the money supply during the Great Depression. Between October 1929 and April 1933, the sum of commercial bank deposits and currency held by the public, which is the definition of M2 money supply used by Milton Friedman and Anna J. Schwartz in “A Monetary History of the United States, 1867-1960,” declined by 38.2%. 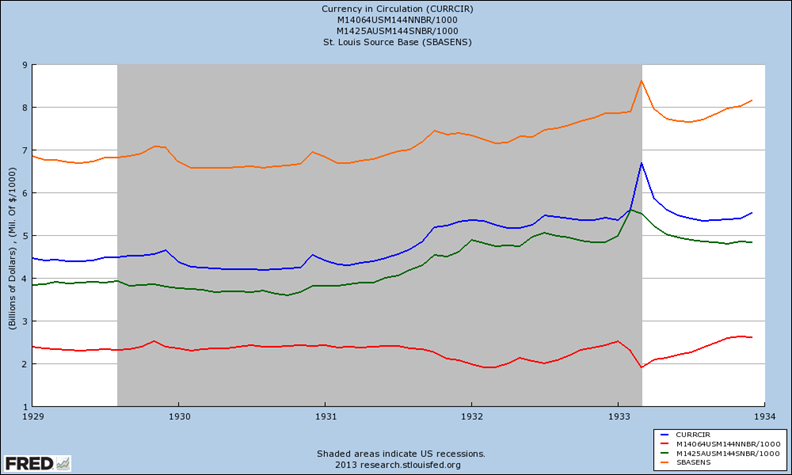 This occurred despite the fact that the monetary base, as measured by St. Louis Source Base increased by 14.9%. The currency held by the public ratio rose from 8.6% in October 1929 to 21.2% in April 1933, after peaking at 22.5% the previous month. The reserve ratio rose from 5.4% to 8.5%. A simple exercise in arithmetic reveals that the increase in the currency ratio accounts for 86.9% of the decline in the monetary multiplier, with the increase in the reserve ratio of course accounting for the remainder. According to “Banking and Monetary Statistics 1914-1941” excess reserves rose from 1.8% to 18.2% of all reserves during this period. The increase was symptomatic of a banking industry fearful of runs on deposits, but it accounts for less than half of the increase in the reserve ratio. Inspection of the data reveals that the currency ratio was fairly constant until the bank panics began. Currency in circulation is in blue, reserves in red, currency held by the public is in green and the monetary base including bank vault cash is in orange. Bank vault cash was more or less stable during this time period except for a temporary surge in March 1933 that coincided with a one month surge in the monetary base. Despite the increase in the reserve ratio the quantity of reserves actually fell from October 1929 to April 1933. But currency held by the public rose from $3.594 billion in October 1930, the month that the bank panics started, to $5.588 billion in February 1933, or by 55.7%. I don’t know from where Koo gets the 85% figure for the proportion of the decrease in the money supply which can be blamed on deleveraging. It is very close to the proportion of the decline in money multiplier accounted for by the rise in the currency ratio, which Koo essentially credits for part if not most of the remaining 15%. But more importantly, the proximate cause was the bank panics, which in turn were caused by bank failures, which in turn were caused by firms and individuals being unable to pay their debts due to the poor state of the economy. If one wants to call the inability to pay debts deleveraging I suppose that may be technically true, but it conceals the actual mechanism by which the money supply contracted, and suggests that deleveraging always causes a reduction in money supply which is empirically false. “Unfortunately there was a period in economics profession, from late 1980s to early 2000s, where many noted academics tried to rewrite the history by arguing that it was monetary and not fiscal policy that allowed the US economy to recover from the Great Depression. They made this argument based on the fact that the US money supply increased significantly from 1933 to 1936. However, none of these academics bothered to look at what was on the asset side of banks’ balance sheets. Exhibit 10 displays the balance sheets of Federal Reserve System member banks. The data comes from “Banking and Monetary Statistics 1914-1941.” What Koo terms “credit extended to the private sector” consists of loans and investments in private domestic securities. “Credit extended to the public sector” consists of investments in federal, state and local government securities. Terming this last category “credit extended” makes it sound like the banks were directly loaning money to the various levels of government, when in fact they were simply investing in government securities. The recession didn’t start until May 1937 so running the exhibit to June 1936 misses nearly a full year of the expansion. And it’s worth noting that not all commercial banks were Federal Reserve members, but as of June 1937, Federal Reserve member banks held 84.5% of all deposits at commercial banks, and hence accounted for the vast majority of Friedman and Schwartz’s M2 measure of money supply. And in any case, there isn’t sufficiently detailed information on non-member commercial bank investments to include their assets in Koo’s categories. The following graph shows nominal GDP (NGDP), Friedman and Schwartz’s M2 measure of money supply, credit market debt (CMD) and the amount of such debt held by Federal Reserve System member banks subdivided by sector at year’s end. 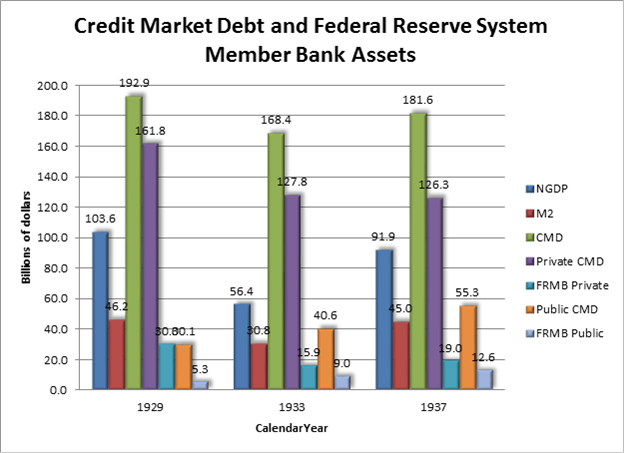 The aggregate credit market debt data comes from “Bicentennial Edition: Historical Statistics of the United States, Colonial Times to 1970” and the figures for the Federal Reserve System member bank assets come from the same source as Koo’s. The key point is there was no shortage of debt to be placed on the asset side of Federal Reserve member bank balance sheets. Member banks’ share of credit market debt declined from 18.3% in 1929 to 14.8% in 1933 before increasing to 17.4% in 1937, so it would seem, in line with our previous reasoning, the decline in member bank balance sheets was more due to the shortage of deposits than the shortage of credit market debt. Extending Koo’s diagram to the final year of the expansion reveals that member banks increased their holding of private debt from 1933 to 1937 almost as much as their holdings of public debt. Furthermore, the rate of increase in general government debt during the contraction from 1929 to 1933 (34.8%) was almost as great as its rate of increase during the expansion from 1933 to 1937 (36.2%). And finally, the rate of increase in nominal GDP was so great during 1933-37 that credit market debt as a percent of GDP declined in every single sector (i.e. household, business and financial), including the government sector, which fell from 72.0% to 60.2% of GDP. We don’t have detailed sector balance sheets for these years, but according to “Studies in the National Balance Sheet” by Raymond W. Goldsmith and Robert E. Lipsey, private sector assets fell from $923.4 billion to $665.0 billion between 1929 and 1933, or by $258.4 billion. Private sector financial assets fell from $540.9 billion to $389.9 billion or by $151.0 billion, accounting for 58.4% of the decrease in private sector asset value. Private sector holdings of stocks fell from $186.7 billion to $101.5 billion, or by $85.2 billion, accounting for 56.4% of the decline in private financial asset value, and nearly a third of the total decline in private sector assets. 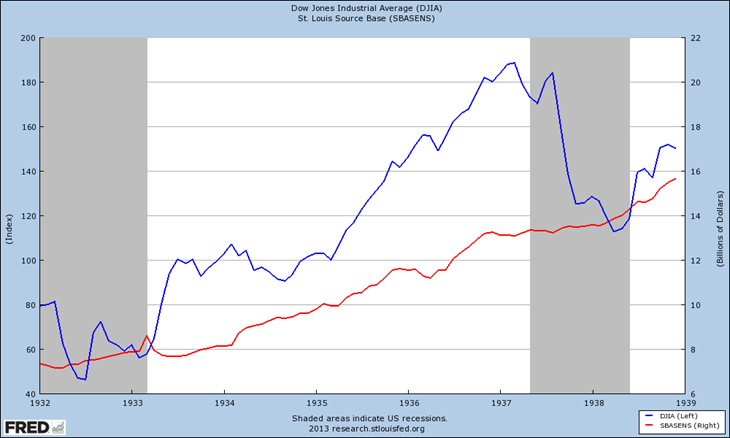 In any case, we don’t have detailed information on sector balance sheets from 1937, but given that it was the decline in the value of stocks that did the most damage to the private sector’s balance sheet during the contraction, it’s not hard to see how this stock market rally went a long way to repairing that damage. “A QE is removed when the private sector is back borrowing money (i.e., maximizing profits) and the central bank is worried that it has to remove excess reserves in the system in order to avoid a runaway inflation. At this juncture, money multiplier is significantly in a positive range. This means it does matter whether the needed removal is $200 billion or $2 trillion, with a larger number having a much bigger impact on interest rates, especially bond yields. Put differently, those central banks who implemented limited or no QE would be much more relaxed than those who implemented massive or “unlimited” QE when the private sector is ready to borrow money again. So far the only successful removal of QE was the one engineered by the Bank of Japan in 2006, when its first-ever quantitative easing in history was ended after five years. This removal went without a hitch because the QE was all at the short end of the market. The removal of reserves at the short end under zero interest rates had very little impact on the rest of the yield curve. For example, the yield on 10-year JGBs jumped by about 40 basis points right after the announcement of the end of quantitative easing, but the yield returned to the original level after a few months. First of all I’m not at all convinced that the Japanese withdrawal of QE, which involved shrinking the monetary base by about 20% from January to September 2006, was successful. After all, much like the unwise U.S. decision to sterilize gold inflows in December 1936, this was soon followed by a very serious recession. Japanese real GDP (RGDP) plunged at a 4.8% annual rate in 2008Q2, and at a 4.0% annual rate in 2008Q3, resulting in consecutive sharp declines in quarterly RGDP before the U.S. economy ever did the same. The monetary base was 17.7% of GDP as of 2013Q1. 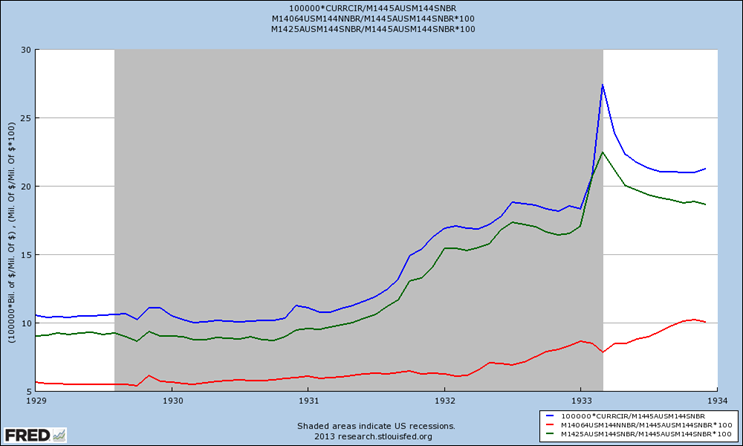 But it reached 22.8% of GDP in 1946Q1 and was greater than its current level during 1939-1941 and again from 1945-47. Reserves peaked at 10.7% of GDP in 2011Q3. But they reached 13.6% of GDP in 1940Q2 and 1940Q3. They were above 10.7% of GDP during much of 1939-41. And the return to the levels they had been before the Great Depression took many years. 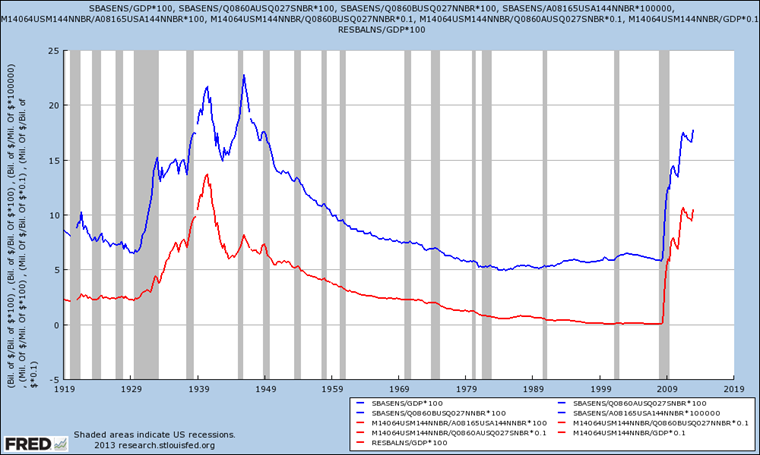 Reserves did not fall to the 2.2% of GDP level they had been in 1929Q3 until 1972Q3, and the monetary base did not fall to 6.5% of GDP until 1975Q4. Koo points out that the Fed, along with the BOE, is in the long end of the market. The Federal Reserve currently holds $487 billion in Treasury bonds (of maturity over 10 years) out of assets of $3,314 billion. Total holdings of Treasury securities are $1,882 billion. Thus Treasury bonds are 14.7% of all Federal Reserve assets and 23.8% of all Treasury security holdings. Treasury bond holdings were $457 billion at the end of the first quarter which was about 2.9% of that quarter’s GDP of $16,004.5 billion at an annual rate. According to “U.S. Monetary Policy and Financial Markets” by Ann-Marie Meulendyke, Treasury bonds were 65.1% of all Treasury securities held in 1941, and total holdings of Treasury bonds reached $10,977.2 million in 1948, which was 23.8% of the monetary base and 4.3% of annual GDP. 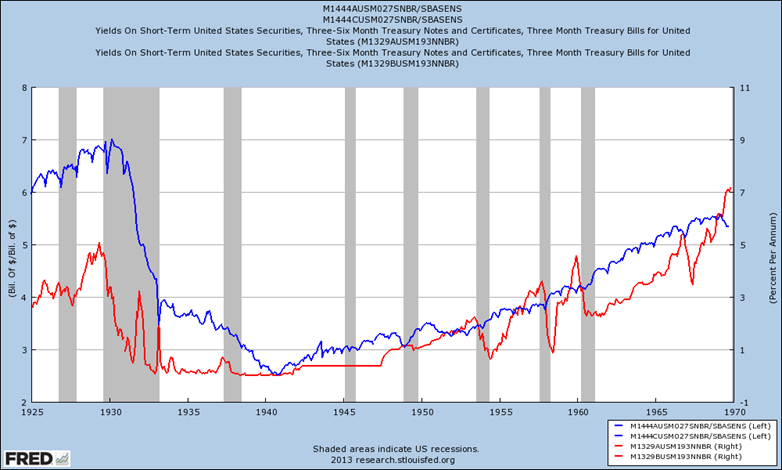 True, Treasury security issuance was dominated by longer term securities back then, but that doesn’t take away from the fact that long term Treasury securities were a larger proportion of both Federal Reserve total assets and all Treasury security holdings than they are today. The money multiplier reached a low of 2.52 in November 1940 when short term interest rates were 0.003%. After the Fed un-pegged the short term rates from the 0.375% rate that had been set from mid-1942 through mid-1947, they were allowed to rise above 1% in August 1948 for the first time since March 1932. But the money multiplier remained close to three, rising only very slowly even as short term interest rates rose high enough by 1953 to resume their more familiar cyclical volatility. Moreover there was never any need to exit from the more than six-fold increase in the monetary base that took place in 1932-48. The most that the monetary base decreased was from $48.413 billion in December 1948 to $42.960 billion in April 1950, or by 11.3%. And even that decrease probably had only minimal negative consequences because of the expected decline in real output following World War II. So given the history of the last time the Federal Reserve spent an extended period of time at the zero lower bound, as well as the availability of newer monetary policy tools (e.g. interest on reserves), I seriously doubt that an exit from QE will be necessary, much less desirable. At some point, people are going to wonder how they ever could have been so led astray by balance sheets in the first place. Those balance sheets make even less sense now, with the recent addition of creative effort, to GDP. It is just mind boggling to me, to think that so many of those concerned about the inclusion of human skill in economic measure, still do not see in front of them the very element of measure for human potential – nominal targeting – as the most basic building block where we can begin. Thank you very much for the great “fact check.” It is an excellent contribution to knocking down some of the fanciful stories about our economic predicament, bordering on absurd, that seem to be getting the most press. Perhaps one day we can get to talking about the “real” issue, get a solution and move on from this nightmare. The modern equivalent of raising the price of gold isn’t QE, it’s a price level target. The “medium of account” used to be gold, now it’s a price index. I agree, targets matter a great deal. For example, although I think the original Japanese QE is greatly underappreciated, it’s clear when one contrasts the 1933-37 recovery with the Koizumi Boom that the Japanese QE failed to accomplish more precisely because they didn’t change their target. Pingback: Classical Values » Insufficient Unto The Day? They have a check in the Vault Cash box for MB. Prior to November 1959 vault cash was not permitted to be used to satisfy reserve requirements. On average only about 73% of vault cash has been used that way since then.